Paul Stocks is used to people being surprised when they first enter the Kitchen Discount Grimsby showroom on Wood Street (off Freeman Street, next turn down after Wellington). There’s a tardis effect in operation because the building (it’s the blue one) doesn’t look too big from the outside but when you step through the door it just seems to keep on going – fifteen full kitchens on display over two floors and these are not just any kitchens. 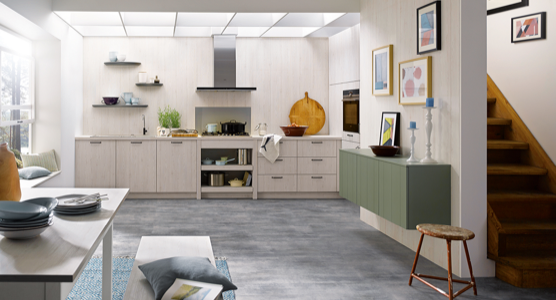 Kitchen Discount Grimsby specialises in kitchens by Schüller, famous for their superb German design, style and engineering. The team also provides a full design and project management service, taking care of everything from plumbing and electrics to plastering and tiling. The business was founded by Paul’s dad, Norman, in 1973 and Paul takes evident pride in the fact that while others have come and gone, Kitchen Discount Grimsby is still in the same place as when they were founded. So how do they compete against the multiples who dominate the market? “Most of our business is repeat business and personal recommendations,” Paul explains.